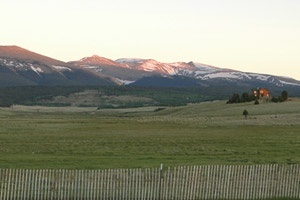 Fairplay, Colorado, real estate is located in a historic town which lies just a half-hour drive from Breckenridge over spectacular Hoosier Pass. The town is the center of the high-altitude plain known as South Park, and includes the historical area called South Park City, a restored 1880's mining town and historical museum. Fairplay was founded in 1867, and is the county seat of Park County, which extends for more than 2 thousand square miles. Fairplay real estate is home to a population of 600, but surrounding residential developments triple that number.On average, property is less expensive in Fairplay than neighboring Alma, and significantly less than Summit County. Highway 9 comes from Breckenridge and forms Fairplay's current main street, which offers food, lodging and a limited amount of retail shopping. Residential streets form a grid to the east, and many rural neighborhoods surround town, like Beaver Ridge just north and east of Hwy 9. Most of these are accessed by unpaved, but well-graded roads. The South Platte River flows to the immediate west of town. Highway 9 tees into Highway 285 - the road that crosses South Park - and at this junction residents and visitors can find a grocery store, hardware and other shopping. A new rec center, several parks, and the restored historic library are recent additions that arose from Fairplay's increasing function as a bedroom community for nearby Summit County. Many of its residents make their living from the busy ski resorts across Hoosier Pass, but like what is rural Colorado, the more open, less densely populated character of Park County. If you would like more information on Fairplay, Colorado real estate, please send us a message online or feel free to call 970.453.2200. We know Park County and real estate and would be happy to discuss this area, or any other, with you.